Update: 10/23/17 It has been pointed out that this could possibly be chalcedony instead of the original hyalite that was guessed. I've updated the title to reflect that until I've properly tested it. Update: 10/26/17 Was not able to scratch it with a 7 mohs hardness pick. That would make it chalcedony. Article updated. This was an interesting specimen that I got while looking for fluorescent quartz. The seller showed me a poor quality UV photo and claimed that the quartz was responding to the UV light. Unfortunately this is one of those times where I took the risk and it failed. 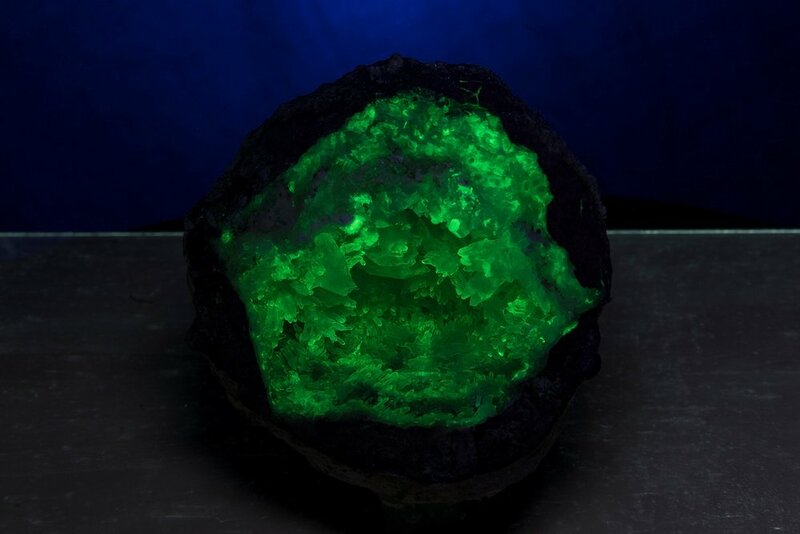 While it was fluorescent, it wasn't the quartz itself that was fluorescing. Instead, there is a secondary formation of chalcedony. I can'tfault it as a daylight specimen though. 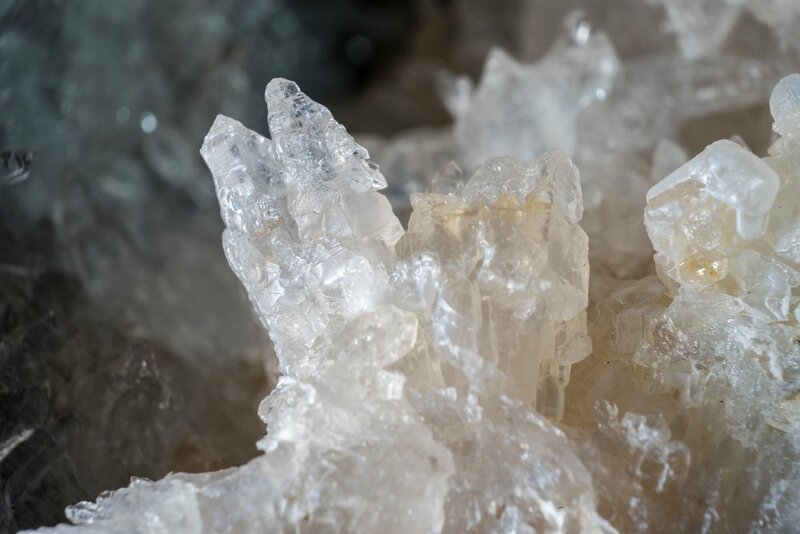 It has many wonderful quartz crystals that are well formed. As a photographer it provides a very interesting contrast that many would not have experienced while collecting geodes. 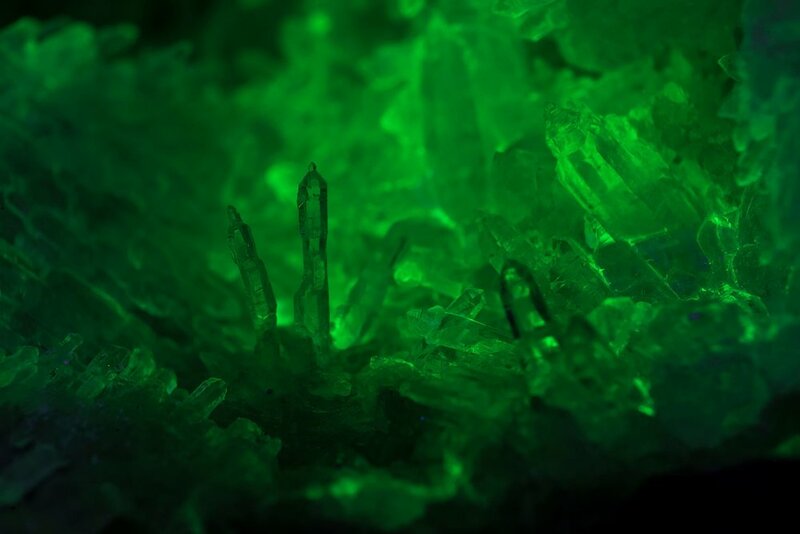 The background is fluorescent providing a light colored background amongst the darker non-fluorescing quartz.